On April 26, Secretary of Defense Jim Mattis told the Senate Armed Services Committee that the Iran nuclear deal includes “pretty robust” verification. He did not give his opinion about whether the United States should withdraw from the agreement, as President Donald Trump has threatened. But he told lawmakers that he had read the 156-page Joint Comprehensive Plan of Action (JCPOA) three times and was struck by how it was “written almost with an assumption that Iran will try to cheat.” The following are excerpts from the hearing on the Department of Defense budget posture and other April remarks. Senator Jack Reed (D-RI): At your confirmation hearing, Mr. Secretary, you indicated that when America gives her word, we have to live up to it and work with our allies, which was, in my view, confirmation of our – the strategic needs to stay within the confines of the JCPOA. What’s your position today Mr. Secretary? Mattis: Senator, I assure you there has been no decision made on any withdrawal from JCPOA. The discussions are ongoing in the national security staff and those of us who are charged with that responsibility of giving the president advice. And it’s going on today as we speak. There are obviously aspects of the JCPOA, the agreement, that can be improved upon. We’re working with our European allies on it at this time, and again, this decision has not been made whether we can repair it enough to stay in it or if the president is going to decide to withdraw from it. Reed: … The issue of repairing those [aspects is] unlikely to be fully accomplished by May 12. Is it your position that if there is an ongoing effort to make such fixes to the agreement that we should stay within the bounds [of the JCPOA]? 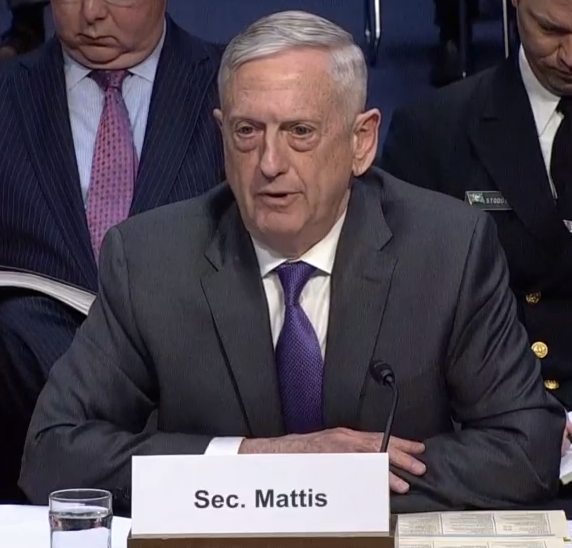 Mattis: We would have to look at what degree of fix we anticipate are achievable and then put that alongside America’s broader interests and decide if its worthy or not. "Right now On JCPOA I’m giving my advice as you know in the ongoing decision process that the President will come to closure on soon so I’d rather not go into details, I will say there are parts of the JCPOA that certainly need to be fixed."